Odin iPod DVD Ripper is easy to use and faster speed than other similar converter software, just a few clicks are enough, super fast DVD movie conversion in high video quality, audio quality plus many advanced features enable you to turn your iPod into a portable movie player. With Odin iPod DVD Ripper,you can convert dvd movies into formats playable on your iPod such as MP4, MP3, AAC and M4A with superb sound and picture quality. Odin iPod DVD Ripper is faster speed than other similar converter software. 3. Extract audio from DVD movie,supported audio format: MP3, WMA, AAC, WAV, OGG, FLAC, APE, M4A, RA, AC3, MP2, AIFF, AMR, SUN AU. 5. Automatically read dvd titles and support ripping titles,audio track. 7. Automatically shut down the computer when ripping finished. convert both PAL/NTSC DVDs to Apple iPod that supports MPEG-4 and H.264 formats. Rip and convert DVD music to iPod audio (MP3, M4A, AAC) so you can listen to your favorite movie scores on your iPod anywhere you go! Qweas is providing links to Odin iPod DVD Ripper 5.3.2 as a courtesy, and makes no representations regarding Odin iPod DVD Ripper or any other applications or any information related thereto. Any questions, complaints or claims regarding this application Odin iPod DVD Ripper 5.3.2 must be directed to the appropriate software vendor. 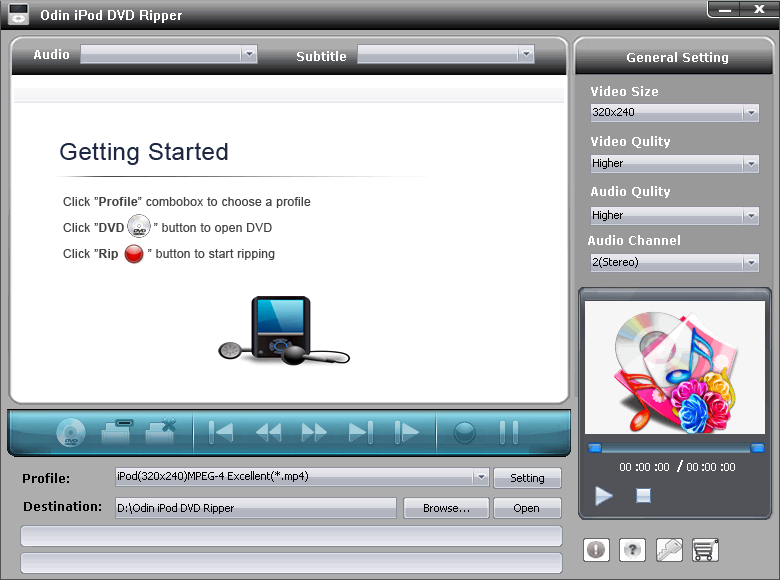 You may click the publisher link of Odin iPod DVD Ripper on the top of this page to get more details about the vendor.